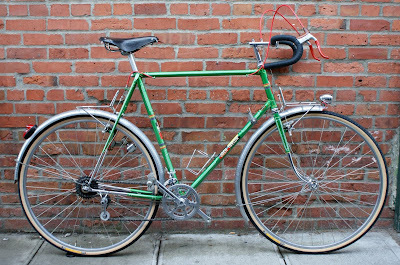 You can see this in person and about 40 other Jack Taylors, and meet Ken Taylor himself, if you come to the Classic Bike Show at the Seattle Bike Expo March 13-14 All Classic bikes welcome of course! Read all about it: http://www.cascade.org/eandr/expo/index.cfm"
You can see original pictures HERE when we had it on the blog for sale. it really cleaned up nice, I knew it would. Too tall for me to ride. Not much vintage lightweight stuff this time, hopefully in the future there will be for. There was a nice Gloria cambio corsa frameset for sale, a selection of 1970s road frames from Allegro to Zeus(really a-Z), and some parts. Mostly rusty junky ol' American bikes. 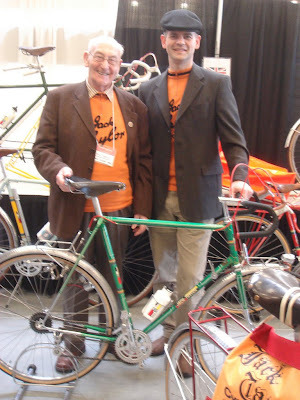 We did find a nice 1950s British bike- Chater lea bits and bobs, that I will photograph soon. Appears it might be a Claud Butler or someone else using Bilaminate lugs. owner listed this chrome bike as a 1960 Carlton, but seems odd a 1960 British bike with a fully sloping fork crown. Any one see one that early? 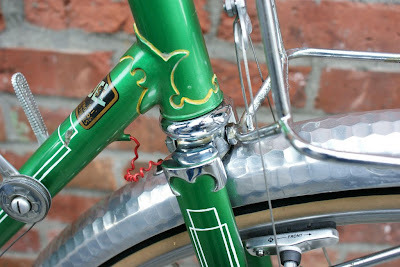 I would have placed a fully sloping fork crown on a British bike in the late 1960s at the earliest. Nice video from back then. I made a blog posting about this bike a while ago, while it was hanging out in the woodshop at the bikeshop. Some asked for pictures and I took some quick ones in poor light. Someone else just asked for better pictures so I brought it downstairs to take better ones in natural light. The bike is all original- except the front wheel and the handlebar grips are of course wrong. "First year for the derailleur Continental. 10 speed. Stronglight 47/50 chainset. 15-17-19-22-25 Atom freewheel cluster. Simplex Competition front derailleur and Simplex Tour de France rear derailleur. 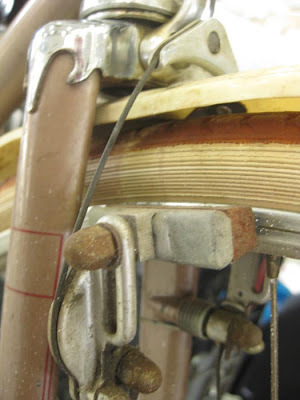 Weinmann side pull brakes. Tubular painted fork with chromed tips. Forged alloy stem with double clamp bolts. Steel? drop bars. Tire size is listed as 27 x 1 1/4 (correct) in the consumer brochure, but as 26" (incorrect) in the model and price sheet. Rims were Rigida steel with knurls on the sides. Hubs were alloy high flange (Normandy?). Yellorex chain. Ideale saddle (#43). Colors were Radiant Red, Radiant Blue, Radiant Green, Radiant Coppertone, and Black. Options included thorn-resistant tubes at $2.00 extra cost and southwest tires and heavy duty tubes for $4.50 extra cost. Frame sizes were 19", 21" and 23". $86.95 "
1884 Columbia high wheeler that we recently sold. Appears to be an early 1960s Schwinn Paramount. I forgot to jot down serial number to check. 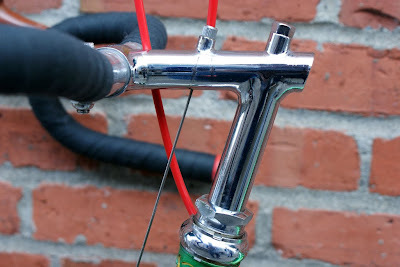 The details point to early 1960s-boxlining, early Campagnolo headset, raised pedal lip Campagnolo cranks, Campy dropouts with hole for Gran Sport spring. 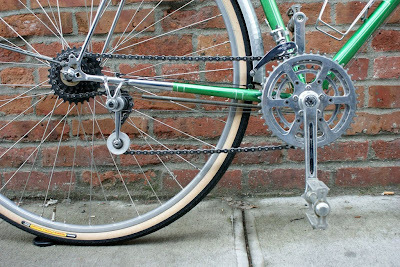 Set up as a fixed gear with Campagnolo inch pitch chainring, 1950s Campagnolo rear hub, and block chain. The current owner bought the bicycle as Sheldon Brown's personal bike. I don't know if he has the info to back up the Provenance, but it should be that difficult, as Sheldon lived a lot online, and continues to do so. A young worker here, let's give him the name. . . .Conner, bought a bicycle from us last year and found the love that only a teenager and a fast bicycle could forge. He was in love. but much like that first love, we usually outgrow them. So he bought a nice Italian frameset and upgraded to a larger frame. At least he will still have the memories. 46cm center to center seattube. 50cm center to center toptube. Comes with Shimano Dura Ace Headset and Bottom Bracket. English threaded. and also included is what appears to be a Shimano Dura Ace seatpost.